As a first-timer here at the Lubec Field Station, I have a different perspective on this mystifying season. My background includes 13 winter (December to March) field seasons in the right whale calving grounds of the Southeast U.S. (SEUS), observing right whales from the shoreline and from the air. 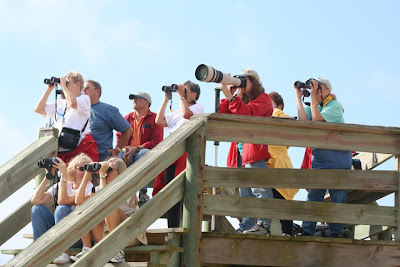 As program coordinator for the Marineland Right Whale Project, sponsored by Associated Scientists at Woods Hole, I work with 200+ citizen scientist volunteers who conduct shoreline surveys from St. Augustine to Daytona Beach in NE Florida. to collect data and photographs as they swim along the shore near the Town of Marineland. The Project also uses an Air Cam for right whale aerial surveys. 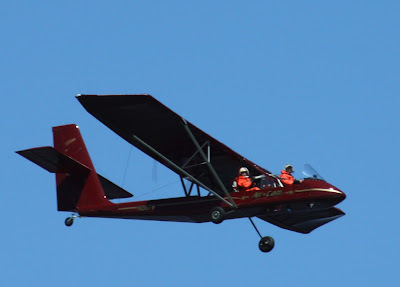 The completely open cockpit, slow-flight characteristics, and quiet twin-engine operation make it ideal for nearshore documentation of right whales and their calves. I was hooked on my first flight in 2002 and earned my pilot's license that year, solely to fly the Project's Air Cam. My aerial survey experience also extends to three seasons of flights in the Northeast, from Long Island, NY to Halifax, Nova Scotia, as an observer for the National Marine Fisheries Services' Atlantic Marine Assessment Program for Protected Species (AMAPPS). in back, both wearing exposure/flotation suits to stay warm and for overwater safety. Thus, I arrived in Lubec at the beginning of August with lots of whale and dolphin exposure, but very little of it from a boat. The prospect of encountering dozens of right whales in a single day also figured to be a novel experience for me. The section of Florida coastline we survey in the winter is in the southern end of the SEUS right whale critical habitat, where we average 30+ right whale sightings for the entire season. Surveying for hours without seeing right whales is a common occurrence. Rather than be disappointed with the absence of right whales in the Bay of Fundy, I am thoroughly enjoying the opportunity to absorb the beauty of this body of water at a leisurely 12 knots, Nereid survey speed. It's my first time to see fin, humpback, and minke whales up close, to hear the powerful whoosh of their blows, to watch fifty white-sided dolphins leaping and splashing around us, and to meet scores of seabirds, including the iconic puffin, who make this place their summer home. Even the wind, rain, and fog that have kept us in Lubec contain an upside, giving me time in the office to improve my understanding of how right whales photographed all along the Atlantic Coast are identified by matching them to whales already in the catalog using the DIGITS program. Since I prepare and submit the data and photographs from the Marineland Project's winter sightings, this gives me a much clearer understanding of the process and the value of this remarkable, collaborative database. Regardless of whether right whales appear in my remaining time here or not, the six weeks I will have spent in this alluring part of the world will benefit the collaboration between our programs and the data we share and, certainly, provide superb, lasting memories.